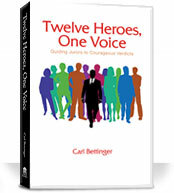 I just finished reading Carl Bettinger’s new book, Twelve Heroes, One Voice. Carl was trained as a doctor, then became a lawyer and now handles medical malpractice and nursing home litigation. First, full disclosure: I love Carl and his contagious enthusiasm for helping people and using sometimes unconventional methods to succeed at trial. I consider him a friend and mentor. He is the attorney who first turned me onto working with improv instructors (I work with Jimmy Carrane of Second City in Chicago, if anybody’s looking for help in this area.) In this book, Carl quotes liberally from other friends and mentors of mine, such as Josh Karton. I’ve been in rooms with Carl when he’s warming up lawyers with high-energy improv techniques. Inevitably, somebody mumbles something like “does this stuff really work?” And inevitably, somebody else in the room who knows Carl explains that in the last couple years, Carl’s received a $54 million nursing home verdict, then always trying to do improve on the past, received a $54.1 million nursing home verdict a year later. This seems to give him credibility. So, how is the book? Excellent. At 178 pages, it is concise in its message–the jury is the hero of the trial. You might read through this quickly and miss the gems in this book because they are so simple, but so few lawyers embrace them. And it is the simple that is usually sublime. We can learn a lot from Hollywood screenwriters who know how to hold an audience’s attention. We, as movie viewers, are used to the little guy overcoming the odds and succeeding because the hero steps out of his everyday role and does something extraordinary to make the world a better place. In order to succeed, the hero at trial must be the jury. The beauty of Carl Bettinger’s book is that he takes the reader beyond theory and gives specific examples, including transcript testimony from his cases, of how to do this. Anybody who’s heard me speak lately has heard me talk about the ideas of story and journey and hero as part of my Fusion idea of trial. Story is one of the 14 ideas that I use to create a case presentation that maximizes the chance of success. Carl recognizes, and I know uses, many of these other ideas as well: Rules of the Road, Reptile, and others. He explains in his book that the idea of Hero is only one part of trial. I believe that it is an essential part, and thank Carl for adding this book to the excellent trial literature currently available at Trial Guides.